Some days, you just can’t catch a good Puck. 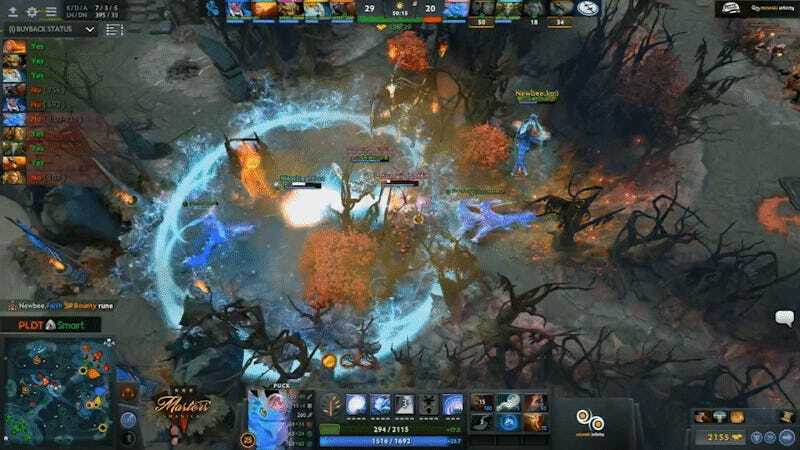 The Manila Masters concluded today with a grand finals between Newbee and Evil Geniuses, a rematch of the winner’s finals. In a 3-1 win for EG, one player showed up time and time again: Sumail “SumaiL” Hassan, the 18-year-old mid-lane master. Whether on Outworld Devourer or the tricky Puck, Sumail had stellar matches every game. In game two, up a win against Newbee, Sumail looked all but caught out, but managed to utilize every tool available with his hero Puck to escape. To break it down, Sumail is locked down by Naga Siren’s song. Once the song drops, he uses his phase shift to avoid any incoming crowd control from Lina or Sand King, and shifts out to shoot his glowing orb. He then pops his Eul’s, which cyclones him into the air and safety, then teleports to his orb and uses his blink dagger to dodge the pursuing Sand King. He wasn’t the only star though, as Ludwig “zai” Wåhlberg had a stellar game in the fourth round against Newbee. On tournament point for his team, while the rest were fighting below in the river, Zai held his own at the team’s shrine, fending off a core and support long enough for his team to regroup and crash on them for the kill. After a long, arduous fight in game four, which seemed to constantly revolve around the pit to Roshan, Evil Geniuses found just the window they needed to take down Newbee. With death timers up to full minutes, the damage output from Sumail and Artour “Arteezy” Babaev was too much, and EG took the game, trophy and $125,000 in prize winnings.